Facebook, The most revolutionary word in the social networking platforms. I would rather say that, Facebook has been a living legend so far. From the past 3years Facebook have been more into people which made it the worlds top 3rd population in world after China and India. So why are we talking about Facebook today? Yes there is a special reason for which i have been waiting from past week to post this article. The main points which i want to discuss about Facebook is about the recent updates which tremendously changed the way Facebook used to be. You may be wondering whats so special in this to discuss about ? But believe me there are a lot of things which you have to know before getting used to the Facebook new interface. i would be telling you the most Pro’s and Con’s of the recent update which took place in July 1st week 2011. Trust me you wont be disappointed reading the article until the end. 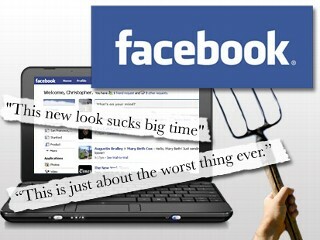 So, let me tell you the advantages and disadvantages of Facebook recent interface upgrade. Facebook has updated its chat interface which caused too many problems for people. There are few upgrades in this area which are really sad to accept. Also there are some things which are okay upto a level. And i don’t think that is necessary for them to do. So here are the Facebook Chat Advantages and Disadvantages. 1) Offline and Online Notification : I don’t think this is really necessary for anyone to know when your friend is online and offline. This upgrade will just show a notification on your friends list whenever he/she is online and offline. But for this you have to keep the window open. Which i think is not possible for anyone, atleast when you have a huge number of friends online. 2) Notification saying your friend is typing : Even this is not necessary for you to make the best use of a chat. Earlier you used to get only a small typing icon on chat window when the other person types. But now it will show a notification saying that Your friend is typing..Take a look at the screenshot below. 3) Chat Window Will Highlight Online/Offline : This is some use to the people to know whether his/her friend is online/offline. In this you upgrade you can find whether that person to whom you were talking,, is online or not. If he/she is online, you can find a bright chat window when highlighted. If not you can see a grey window when highlighted on chat window. 4) Chat Windows Doesn’t Redirect to Your Friend Profile : This is the most saddest part which i didn’t like at all. 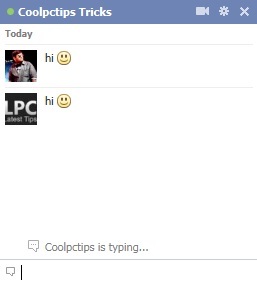 Earlier when ever we used to chat with our friends, we used to see his name above the chat window. The name used to be underline which will be redirected to the person’s profile if clicked. I don’t know what made them to remove that feature now. I have to go through search to find his/her profile if i want to check his/her profile. But thank god you can still click and see his/her profile from clicking inside the chat. But this is only possible when atleast once they have replied to your message. You can click on their picture which will redirect to there profile. 5) Distance Between Each Chat Window : You can find a small gap between each chat window when you have opened more than one chat windows at a time. I don’t think this is really necessary to update. But it is looking neat now. Just the visual appearance is neat now. Also the window is embedded within the line of browser which looks like floating in air. 6) Limit Availability : Only god knows what this option is meant for. It has been updated to few Facebook profile in the chat options and till now no one has ever touched it. Seriously i am waiting for some one to explore it. I don’t know why this upgrade is not yet in my profile. 7) Small Chat Gear For Options : You can observe a small gear in your friends chat window which will allow you to clear your window after a chat and also one more option where you can Report chat if necessary when you have been troubled by someone. 8 ) Slim Who is Online Window : The online who is online users panel is a bit slim and light compared to old. The window is too slim and saving a lot of space to show the other information on the news feed. 9) Reorder Chat : You can reorder you friends categories according to your priority. If you are confused what are categories meant for, We will write a different post for you and publish it later. This is the best option you can keep some people out of your chat forever. But still you can be online to others and be there friends. 10) Chat Online Even If You Are Not : Some times even if you are not online, your friends can see you online. This is because you have not signed out of the Facebook account, but closed the window to open later. Which will show people that you are online. So its better you logout your Facebook account if you are not using it. And many more bad upgrades which are make people to go away to Google Plus. To be frank, Every change that facebook makes is an invitation for G+ so better Facebook concentrate more on some bugs and try not to introduce more and more featured to compete Google Plus. Atleast until people get used to the older ones. This is really insane. You can find some good options in your friends profile and some are still struggling to get the basic updates. The profile is update for different for different users. Some are very major upgrades like Chat appearance, Options, Video Calls, and etc. There are many flaws in the upgrades made by Facebook recently. They have to soon realize it before people move on to Google +. Some of the people have a very bad experience with their chats, Recently the article which we posted New Facebook Chat Upgrade Interface Irritates Millions of People Online made people atleast to take a deep breath that this is not happening only to them. You will be asked to install a small application which will then allow you to make video call to your friends whenever you want to. Just you can video call a person either by going to there profile or by from their chat window which shows a small video camera icon. See the screenshot above of my best friend Laxmi to get a clear idea on how the icon looks like. This option can be seen only when you install the application which is provided by Facebook. As per now these are the major upgrades in Facebook Interface. As you can see that Facebook has been trying to improve the chat and video calling a lot. Now Facebook is running with www.beta.facebook.com link in some profiles. May be some more features will be added in future competing Google Plus. Facebook Addiction Disorder Symptoms and Treatment – Go Get a Life! This is a wonderful post and I appreciate your efforts during the year to reach a no. of 200 successful and helpful posts. I also appreciate your commitments for future which I am sure you would take over with lot more. congratz for 200 th artcle sir ! !